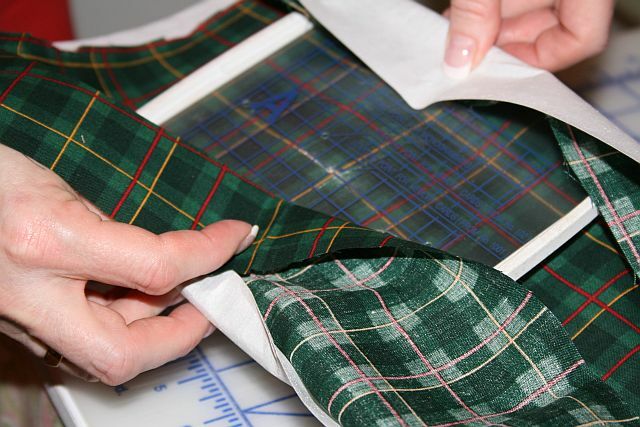 Placement is usually easiest if you can decide exactly where on your fabric that you want the design. The green fabric shown is going to become an embroidered Christmas stocking cuff that says, “Daddy”. Placement is key for a nice project. We made a stocking cuff pattern piece/embroidery placement template to make sure we get this right. Our pattern piece has an embroidery design placement cross hairs marked on it to help us see where the “Daddy” will end up. 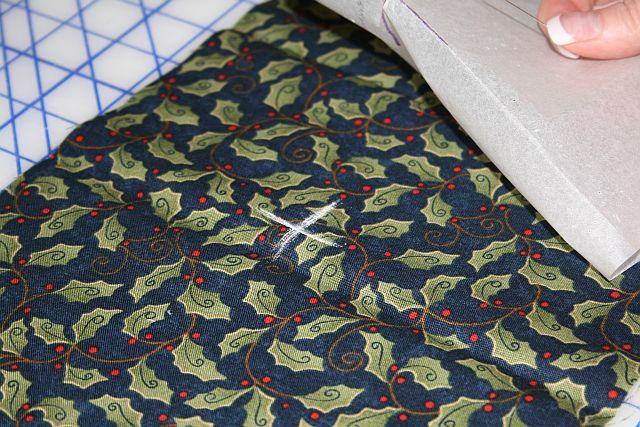 Step Five: Use a placement sticker or use a fabric marking tool to mark the design’s cross hairs onto your fabric. We folded the paper back along the cross hair vertically and marked the vertical line. Then we folded the paper back along the cross hair horizontally and marked the horizontal line. Step 6: Once your fabric is marked, place your plastic hoop grid in your inner hoop. 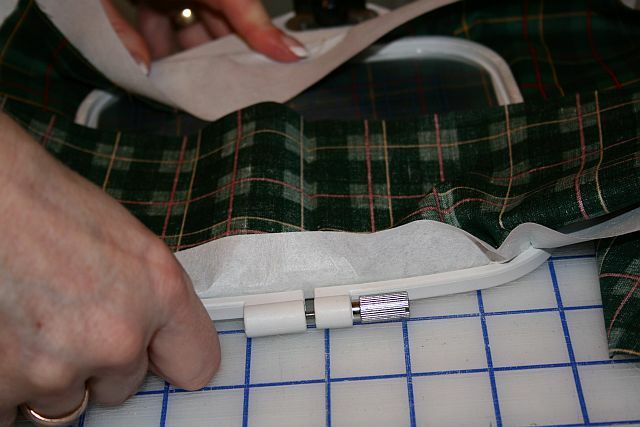 Lay the inner hoop on top of your marked fabric aligning the hoop grid cross hairs with your marked cross hairs. Step 7: Now, everything is perfectly aligned and if you can just snap it into your outer hoop without the fabric shifting, you’ll have everything aligned as needed. To prevent shifting, we like to wrap the stabilizer and fabric around the edge of the inner hoop and grasp firmly as we position it and lay it into the outer hoop. Step 8: Next, tighten the hoop screw. Step 9: If the fabric is loose or kind of ripply in the hoop, you can gently tug it (be careful not to tug harder on one side than the other) to help it spread out evenly and tightly in your hoop. (Be careful how you tug the fabric or you’ll pop it right out of the hoop and/or possibly mis-shape it). Step 10: Snap your hoop onto your machine. Remove the plastic hoop grid. 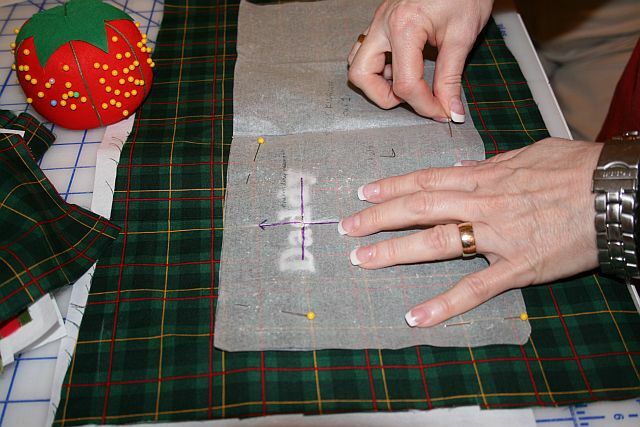 Align the needle with your marked cross hairs and embroider your design. 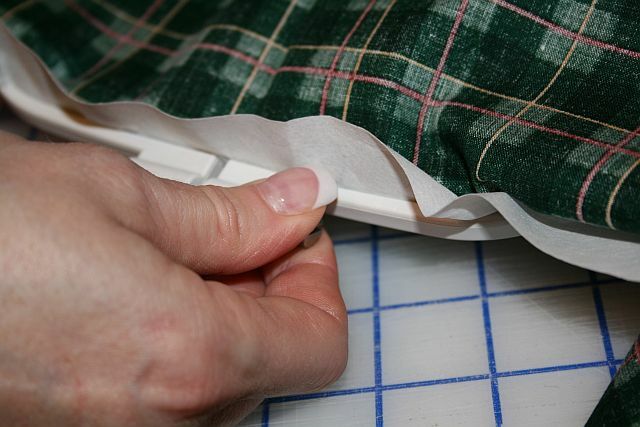 Step 11: Once your design is stitched out, remove your fabric from the hoop and press if desired. Step 12: The neat thing about using templates is that they also help you know where to place your pattern piece to cut out your fabric. After we embroidered, we then laid our cuff pattern piece onto our fabric again and used the template cross hairs to make sure we had “Daddy” in the right place before we pinned the pattern to fabric and cut out the cuff. After that, we assembled our stocking according to the pattern instructions. I hope you found this useful. 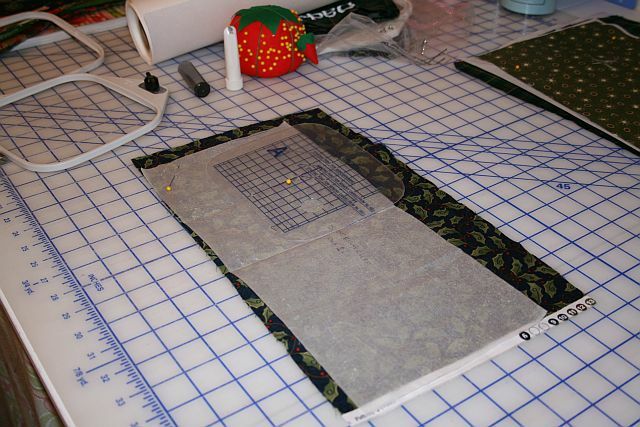 These are my “go to” steps for successful embroidery placement in projects. By the way, I have created the pattern and typed up illustrated sewing instructions for these stockings. The first 3 people to request a free copy of this project can have it! Just post your comment here and I’ll leave it for you at Humble Sewing Center. This entry was posted in Accessories, Machine Embroidery FYI, Project Tutorials, Tips/Techniques FYI and tagged hooping tips, machine embroidery, placement tips on December 5, 2011 by Jenny Gabriel. I would like a pattern. 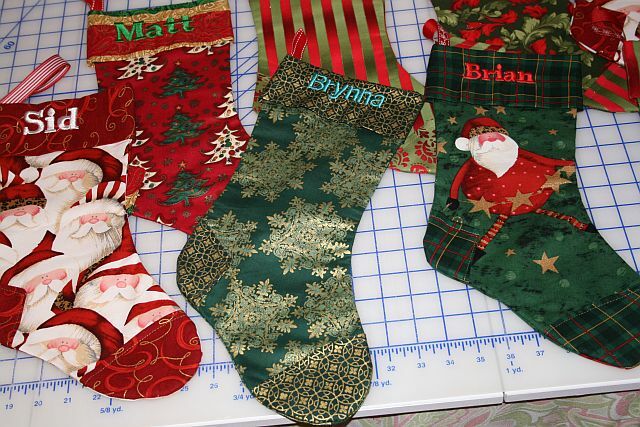 I need to make some stockings. I haven’t had a chance to drop off the stocking pattern at HSC. I’m going to try and scan it into a printable PDF pattern this weekend and email it to you. I would love a pattern to make stockings for my great nieces.